Are you looking for the match Afghanistan vs SouthAfrica live score updates and Live Streaming? This is your site to know about the 20th Match of T20 World Cup 2016. 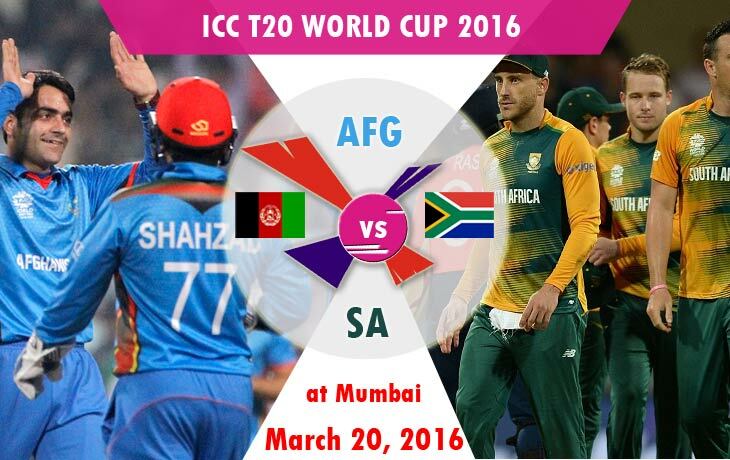 The match, Afghanistan vs SouthAfrica will be held at Wankhede Stadium, Mumbai, India on March 20, 2016. Both of the team meets each other after the T20 World Cup 2010. It is the second match for both of the team in this Super 10 Word Cup 2016. In last, Afghanistan lost the game by 6 wickets against with SriLanka and SouthAfrica lost their game by 2 wickets against with England. About the Match 16 ICC T20 World 2016: Whereas, Afghanistan won the toss and elected bat first at Eden Garden on last Thursday. Captain of the team, Asghar Stanikzai lined-up as No.3 and hits 62 runs in 47 balls with four sixes. After his batting, Samiullah Shenwari scored 31 runs as a second highest score of the innings. The spinners of Afghanistan, Mohammad Nabi and Rashid Khan took one wickets each and controlled the opponents score. In last Five matches, SouthAfrica won only two of them, especially, the team forget to win the last three games. We may expect AB de Villers Original hands in this match. He didn’t play as an opener in recent match. An instant of him, Hashim Amla and Quinton de Kock walks with the bat on opening and also both of them played well and scored 58 and 52 respectively against the team, England on Friday on this same ground. One of Middle man, JP Duminy has also scored 54 runs in 28 with three sixes till the end of innings. Kyle Abbott and Kagiso Rabada bowled good and added their wickets as three and two by giving three and one six.